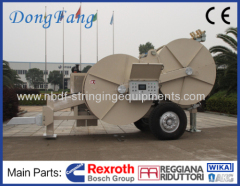 Overhead Cable Puller Tensioner is used for overhead line stringing and maintenance work. 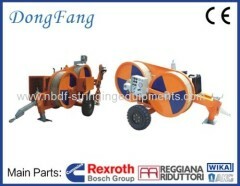 The Hydraulic puller tensioner can be equipped with hydraulic reel winder for reconductoring (OPGW exchange) operation. All the hydraulic puller tensioners are equipped with diesel engine, closed hydraulic circuit system, big bull wheels. We have produced 4 ton, 6 ton and 8 ton hydraulic puller tensioners. 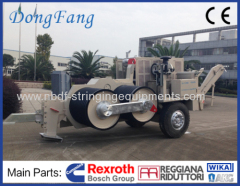 4 Ton Hydraulic Puller Tensioner is widely used in OPGW stringing or change, big crossing project, reconductoring operation in line maintenance. 40 KN Hydraulic Puller Tensioner is widely used in OPGW change operation, big crossing project, reconductoring operation in maintenance of power line. 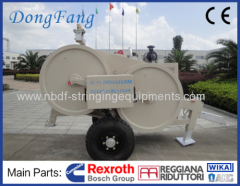 6 Ton Hydraulic Puller Tensioner is widely used in big conductor stringing project, reconductoring operation in maintenance of power line. 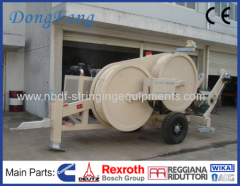 Group of Hydraulic Cable Puller Tensioner has been presented above, want more	Hydraulic Cable Puller Tensioner and Overhead Cable Puller Tensioner, Please Contact Us.